More than 100 whales are languishing in tightly-packed pens in a shocking ‘whale prison’ in Srednyaya Bay, Russia. Activists fear they will be sold to China where they’ll be imprisoned and forced to perform tricks in marine parks. Activists say 90 Beluga whales and 11 Orca whales are trapped in holding pens after likely being captured and cruelly torn from their pods in the wild. 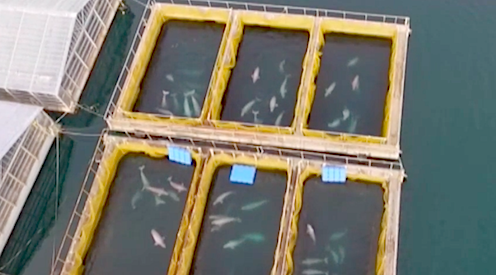 Drone footage shows the whales swimming forlornly inside their small prisons. It’s difficult to tell how old the whales are, but because there are many in each pen, they could be young. 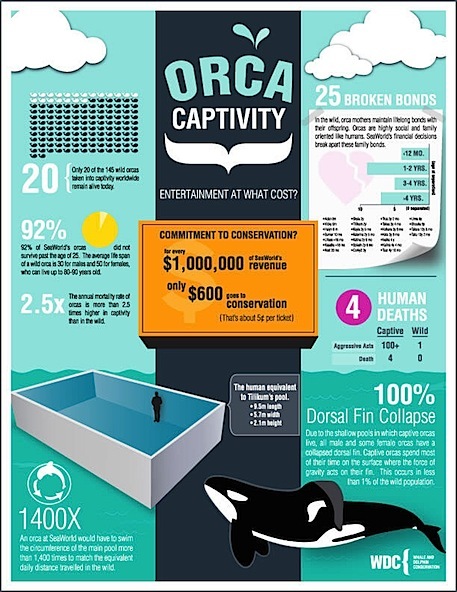 Orca whales usually stay with their mothers for a number of years and can be traumatised when they are separated. “Under the guise of enlightenment and culture, dirty business is conducted on rare orcas. Currently 13 killer whales are being exported from Russia to China,” Greenpeace told RIA Novosti. Another worrying video from the mysterious whale prison near Nakhodka in Russia’s Far East shows a whale being transported by a crane from one tank to another, suggesting the whales could already be on their way to China, where a booming marine park market is driving demand for captured whales. There are 60 marine parks in the country, with an additional 36 opening in the next two years. Until they were recognized as highly toxic and carcinogenic, polychlorinated biphenyls (PCBs) were once used widely. Their production was banned in the United States in 1978, though they are still produced globally and persist in the environment. Persistent organic compounds, like PCBs, magnify across trophic levels, and thus apex predators are particularly susceptible to their ill effects. Desforges et al. looked at the continuing impact of PCBs on one of the largest marine predators, the killer whale. Using globally available data, the authors found high concentrations of PCBs within killer whale tissues. These are likely to precipitate declines across killer whale populations, particularly those that feed at high trophic levels and are the closest to industrialized areas. If Gus understands correctly from other articles on PCBs, there is not a single inventory of the amount of PCBs ever produced on this planet by humans. PCBs do not exist in a natural state (apart from a simple compound found in tar) and have been banned from manufactured in many countries due to their strong carcinogenic properties and also due to their strong fertility reducing properties. Some countries still manufacture PCBs. The closest figure to date, though possibly underestimated, is that 1.3 million tonnes of these long lasting basically indestructible slow-killing "poisons" (aligned with dioxins) have been released into the environment and 9 million tonnes are kept in holding tanks, awaiting a new chemical "invention" to destroy them. Humpback whales, once hunted around the world to the point that they became so rare that the industry built on their blubber went belly-up, is booming. The world's largest humpback whale population is particularly strong in Australia's Kimberley, a region that provides ideal and undeveloped calving grounds, researchers say. Since the whaling stations were closed, humpbacks that visit Western Australia have become the good news story that defies the trend of environmental doom and gloom. Many travel all the way up Australia's west coast to the remote Kimberley — a region twice the area of the United Kingdom with just 50,000 residents. So why do whales visit the Kimberley and what threats do they face? That was a question audience member Ric Kornaus put for the ABC to investigate for our Curious Kimberley series. Mr Kornaus first visited the Kimberley in the 1980s and enjoyed camping on the remote coast north of the small town of Broome. Since that time, Broome has become a popular tourist destination and mining and gas projects have been developed along the coast, prompting Mr Kornaus to ask what impact this has had on the whales that visit the Kimberley. "What is the affect on them, whether their numbers are dropping or static, or what?" he asked. Curt Jenner and his wife Micheline started studying humpback whales on the west coast of Australia almost 30 years ago in an effort to find out if they could recover from near annihilation. "We were trying to understand if the Western Australian population, which is historically the largest population on the planet … was actually recovering," he said.